We are a community street celebration founded by Harvey Milk in 1974. The Fair is located in the heart of San Francisco's Castro District, at the intersection of Market & Castro Streets and the surrounding area. The web server used by Castrostreetfair.org is run by NOC4Hosts and is located in Tampa, USA. This web server runs 9 other websites, their language is mostly english. Only a few websites on this web server are x-rated. 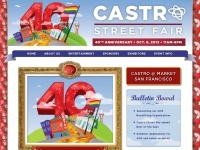 The Castrostreetfair.org websites were developed using the programming language PHP and served by a Apache server. XHTML 1.0 Transitional is used as markup language on the webpages. To analyze the visitors, the websites uses the analysis software Google Analytics. The website does not specify details about the inclusion of its content in search engines. For this reason the content will be included by search engines.